For other uses of "Border Patrol", see Border Patrol (disambiguation). With 19,437 agents, the Border Patrol is one of the largest law enforcement agencies in the United States. For fiscal year 2017, Congress enacted a budget of $3,805,253,000 for the Border Patrol. The current chief of the Border Patrol is Carla Provost. Mounted watchmen of the United States Department of Commerce and Labor patrolled the border in an effort to prevent illegal crossings as early as 1904, but their efforts were irregular and undertaken only when resources permitted. The inspectors, usually called "mounted guards", operated out of El Paso, Texas. Though they never totaled more than 75, they patrolled as far west as California trying to restrict the flow of illegal Chinese immigration. In March 1917, Congress authorized a separate group of mounted guards, often referred to as "mounted inspectors". Most rode on horseback, but a few operated automobiles, motorcycles and boats. Although these inspectors had broader arrest authority, they still largely pursued Chinese immigrants trying to avoid the National Origins Act and Chinese Exclusion Act of 1882. These patrolmen were Immigration Inspectors, assigned to inspection stations, and could not watch the border at all times. U.S. Army soldiers along the southwest border performed intermittent border patrolling, but this was secondary to "the more serious work of military training." Immigrants encountered illegally in the U.S. by the Army were directed to the immigration inspection stations. Texas Rangers were also sporadically assigned to patrol duties by the state, and their efforts were noted as "singularly effective". 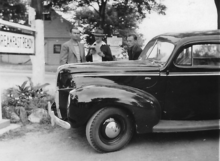 During the 1940 Border Patrol expansion, four newly hired agents from the northeastern states drove this new pursuit vehicle from the Ford factory in Detroit to El Paso where they would receive training. 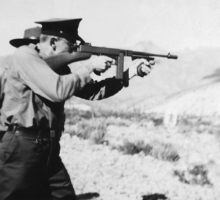 A Border Patrol Agent practice firing a Thompson submachine gun near El Paso in 1940. The National Origins Act authorized the formation of the U.S. Border Patrol on May 26, 1924. Two days later, the Labor Appropriation Act of 1924 established the Border Patrol as an agency of the U.S. Department of Labor assigned to prevent illegal entries—primarily along the Mexico–United States border, as well as the Canada–U.S. border. The first Border Patrol station began operations in Detroit, Michigan in June 1924. A second station in El Paso, Texas began operations in July 1924. In 1925, coastal patrols began as well. Operations were established along the Gulf Coast in 1927 to ensure that foreign crewmen departed on the same ship on which they arrived. In 1932, the Border Patrol was divided into two offices. Mexican border operations were directed from El Paso, Texas and Canadian border operations were directed from Detroit, Michigan. The Canadian border operations from Detroit employed more men than the El Paso operations along the Mexican border because of a focus on the prevention of liquor smuggling during prohibition. Franklin Delano Roosevelt's Executive Order 6166 formed the Immigration and Naturalization Service (INS) in 1933 by consolidation of the Bureau of Immigration and the Bureau of Naturalization. Following the outbreak of World War II in Europe, Border Patrol staffing doubled to 1,500 in 1940, and the INS was moved from the Department of Labor to the U.S. Department of Justice. Additional stations were temporarily added along the Gulf Coast, Florida and the Eastern Seaboard during the 1960s after Fidel Castro triumphed in the Cuban Revolution and that was followed by the Cuban Missile Crisis. INS was decommissioned in March 2003 when its operations were divided between CBP, United States Citizenship and Immigration Services, and U.S. Immigration and Customs Enforcement. In the wake of the attacks of September 11, the Border Patrol was placed under the umbrella of the Department of Homeland Security, and preventing terrorists and terrorist weapons from entering the United States was added to its mission. The Border Patrol's traditional mission continued: deterring, detecting and apprehending illegal immigrants and individuals involved in the illegal drug trade who generally entered the United States at places other than through designated ports of entry. The Border Patrol also erected[when?] 33 permanent interior checkpoints near the southern border of the United States. For fiscal year 2017, the nationwide total of Border Patrol agents was 19,437, with 16,605 patrolling the southern border. Agents primarily patrol the Mexico–United States border, where they control drug trafficking and illegal immigration. The majority of Border Patrol agents are minorities. According to 2016 data, Latinos comprise slightly more than 50% of the Border Patrol. The Border Patrol's priorities have changed over the years. In 1986, the Immigration Reform and Control Act placed renewed emphasis on controlling illegal immigration by going after the employers that hire illegal aliens. The belief was that jobs were the magnet that attracted most illegal aliens to come to the United States. The Border Patrol increased interior enforcement and Form I-9 audits of businesses through an inspection program known as "employer sanctions". 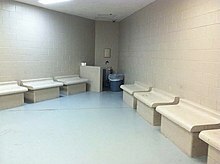 Several agents were assigned to interior stations, such as within the Livermore Sector in Northern California. Employer sanctions never became the effective tool it was expected to be by Congress. Illegal immigration continued to swell after the 1986 amnesty despite employer sanctions. By 1993, Californians passed Proposition 187, denying benefits to illegal aliens and criminalizing illegal aliens in possession of forged green cards, identification cards, and Social Security numbers. It also authorized police officers to question non-nationals as to their immigration status and required police and sheriff departments to cooperate and report illegal aliens to the INS. Proposition 187 drew nationwide attention to illegal immigration. United States Border Patrol Interior Checkpoints are inspection stations operated by the USBP within 100 miles (160 km) of an international border (with Mexico or Canada) or any U.S. coastline, or in the Florida Keys. El Paso Sector Chief Patrol Agent Silvestre Reyes started a program called "Operation Hold the Line". In this program, Border Patrol agents would no longer react to illegal entries resulting in apprehensions, but would instead be forward deployed to the border, immediately detecting any attempted entries or deterring crossing at a more remote location. The idea was that it would be easier to capture illegal entrants in the wide open deserts than through the urban alleyways. Chief Reyes deployed his agents along the Rio Grande, within eyesight of other agents. The program significantly reduced illegal entries in the urban part of El Paso, however, the operation merely shifted the illegal entries to other areas. Congressman Duncan Hunter became a major proponent of border fencing in the San Diego sector; surplus military landing mats were obtained to use as an initial border fence. Stadium lighting, ground sensors and infra-red cameras were also placed in the area. Eventually the primitive landing mat fence was replaced with a modern triple fence line that begins over one hundred yards into the Pacific Ocean at Imperial Beach, CA and ends more than 13 miles (19 km) inland on Otay Mesa where the mountains begin. An agent armed with an M14 rifle tracking someone in harsh winter conditions on the northern border. Through agency whistleblowers, Agent Mark Hall and Agent Robert Lindemann, it was revealed that in 2001, the Border Patrol had approximately 324 agents assigned along the Canada–United States border. Northern border staffing had been increased by 1,128 agents to 1,470 agents by the end of fiscal year 2008, and is projected to expand to 1,845 by the end of fiscal year 2009, a sixfold increase. Resources that support Border Patrol agents include the use of new technology and a more focused application of air and marine assets. The northern border sectors are (west to east): Blaine (Washington), Spokane (Washington), Havre (Montana), Grand Forks (North Dakota), Detroit (Selfridge ANGB, Michigan), Buffalo (New York), Swanton (Vermont), and Houlton (Maine). 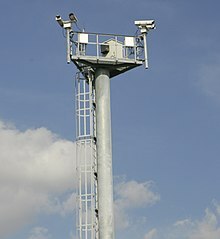 Cameras add "Smart Border" surveillance. The United States border is a barely discernible line in uninhabited deserts, canyons, or mountains. The Border Patrol utilizes a variety of equipment and methods, such as electronic sensors placed at strategic locations along the border, to detect people or vehicles entering the country illegally. Video monitors and night vision scopes are also used to detect illegal entries. Agents patrol the border in vehicles, boats, aircraft, and afoot. In some areas, the Border Patrol employs horses, all-terrain motorcycles, bicycles, and snowmobiles. Air surveillance capabilities are provided by unmanned aerial vehicles. The primary activity of a Border Patrol Agent is "Line Watch". Line Watch involves the detection, prevention, and apprehension of terrorists, illegal aliens and smugglers of aliens at or near the land border by maintaining surveillance from a covert position; following up on leads; responding to electronic sensor, television systems and aircraft sightings; and interpreting and following tracks, marks, and other physical evidence. Major activities include traffic check, traffic observation, city patrol, transportation check, administrative, intelligence, and anti-smuggling activities. Traffic checks are conducted on major highways leading away from the border to detect and apprehend illegal aliens attempting to travel further into the interior of the United States after evading detection at the border, and to detect illegal narcotics. Transportation checks are inspections of interior-bound conveyances, which include buses, commercial aircraft, passenger and freight trains, and marine craft. Marine Patrols are conducted along the coastal waterways of the United States, primarily along the Pacific coast, the Caribbean, the tip of Florida, and Puerto Rico and interior waterways common to the United States and Canada. Border Patrol conducts border control activities from 130 marine craft of various sizes. The Border Patrol maintains watercraft ranging from blue-water craft to inflatable-hull craft, in 16 sectors, in addition to headquarters special operations components. Horse and bike patrols are used to augment regular vehicle and foot patrols. Horse units patrol remote areas along the international boundary that are inaccessible to standard all-terrain vehicles. Bike patrol aids city patrol and is used over rough terrain to support linewatch. Snowmobiles are used to patrol remote areas along the northern border in the winter. U.S. Border Patrol Agents at the Greyhound bus station in Detroit, Michigan in February 2011. Immigration checks on trains, buses, and highways within 100 miles of the northern border have become more common. In 1992, the United States Border Patrol had approximately 4,139 Patrol Agents on the job. Attrition in the Border Patrol was normally at 5%. From 1995–2001 annual attrition rose to above 10%, which was a period when the Border Patrol was undergoing massive hiring. In 2002 the attrition rate climbed to 18%. The 18% attrition was largely attributed to agents transferring to the Federal Air Marshals after 9/11. Since that time the attrition rate has decreased. Congress increased journeyman Border Patrol Agent pay from a GS-9 rate to a GS-11 rate in 2002. The Border Patrol Marine Position was created in 2009 (BPA-M). The Intelligence Reform and Terrorism Prevention Act of 2004 (signed by President Bush on December 17, 2004) authorized hiring an additional 10,000 agents, "subject to appropriation". This authorization nearly doubled the Border Patrol manpower from 11,000 to 20,000 agents by 2010. As of 2016, roughly half of the agents are Latino Americans. The Secure Fence Act, signed by President George W. Bush on October 26, 2006, has met with much opposition. In October 2007, environmental groups and concerned citizens filed a restraining order hoping to halt the construction of the fence, set to be built between the United States and Mexico. The act mandates that the fence be built by December 2008. Ultimately, the United States seeks to put fencing around the 1,945-mile (3,130 km) border, but the act requires only 700 miles (1,100 km) of fencing. DHS secretary Michael Chertoff has bypassed environmental and other oppositions with a waiver that was granted to him by Congress in Section 102 of the act, which allows DHS to avoid any conflicts that would prevent a speedy assembly of the fence. This action has led many environment groups and landowners to speak out against the impending construction of the fence. Environment and wildlife groups fear that the plans to clear brush, construct fences, install bright lights, motion sensors, and cameras will scare wildlife and endanger the indigenous species of the area. Environmentalists claim that the ecosystem could be affected because a border fence would restrict movement of all animal species, which in turn would keep them from water and food sources on one side or another. Desert plants would also feel the impact, as they would be uprooted in many areas where the fence is set to occupy. Property owners in these areas fear a loss of land. Landowners would have to give some of their land over to the government for the fence. Citizens also fear that communities will be split. Many students travel over the border every day to attend classes at the University of Texas at Brownsville. Brownsville mayor Pat Ahumada favors alternative options to a border fence. He suggests that the Rio Grande be widened and deepened to provide for a natural barrier to hinder illegal aliens and drug smugglers. 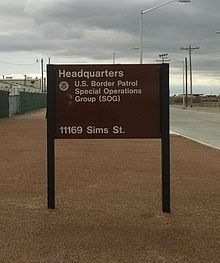 In 2007, the U.S. Border Patrol created the Special Operations Group (SOG) headquartered in El Paso, TX to coordinate the special operations units of the agency. The U.S. Border Patrol has a number of other specialized programs and details. Marine Patrol – In the riverine environments of the northern and southwestern borders of the continental United States, the Border Patrol conducts border control activities from the decks of marine craft of various sizes. Since 2006, the U.S. Border Patrol has relinquished its littoral law enforcement missions in the Great Lakes and territorial seas to the Office of Air and Marine. The U.S. Border Patrol maintains over 130 vessels, ranging from blue-water craft to inflatable-hull craft, in 16 sectors, in addition to Headquarters special operations components. K9 Units, Mounted Patrol, Bike patrol, Sign-cutting (tracking), Snowmobile unit, Infrared scope unit, Intelligence, Anti-smuggling Investigations Unit (ASU/DISRUPT, Border Criminal Alien Program, Multi-agency Anti-Gang Task Forces (regional & local units), Honor Guard, Pipes and Drums, Chaplain, Peer Support, Mobile Surveillance Unit. This rescue beacon states in English and Spanish: "Attention: You Cannot Walk To Safety From This Point! You Are In Danger of Dying If You Do Not Summon Help! If You Need Help, Push Red Button, U.S. Border Patrol Will Arrive in One Hour, Do Not Leave This Location"
"Operation Gatekeeper" was launched in 1994 to stop migrants from crossing illegally into the United States. The strategy included increased enforcement and extensive fencing near border cities, with the twofold purpose of deflecting migrants to remote areas where they could more easily be detected and apprehended, as well as using the formidable mountains, deserts, and Rio Grande as a deterrent to easy passage. The newly erected Mexico–United States barrier—which at some remote locations is no more than a fence—has also forced migrants and human traffickers to seek out remote desert locations in California, Arizona, New Mexico and Texas where they may attempt crossing. The "funnel effect" created by both these strategies has contributed to the deaths of thousands of migrants, whose remains are often found in the hot desert or freezing mountains. As early as 1998, the former Immigration and Naturalization Service implemented the Border Safety Initiative in response to concerns about the number of migrants injured or killed while attempting to cross the border. It was noted that Border Patrol agents routinely supplied water, food, and medical care to migrants. That same year, Border Patrol, Search, Trauma and Rescue (BORSTAR), a specialized unit trained in emergency search and rescue, was established with the purpose of assisting injured or stranded migrants at remote locations. 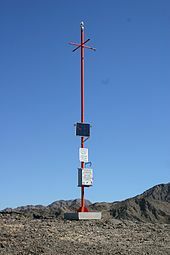 In 2002, the first "rescue beacons" were installed in desert areas considered especially dangerous. 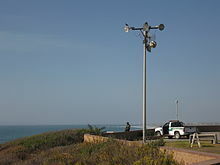 The beacons are solar powered and highly visible, and have a button which alerts Border Patrol agents by radio signal, after which a helicopter or ground unit is dispatched. U.S. Senator Bill Frist commented in 2006: "these beacons, I believe, are an absolutely vital link in our border security system... We know that beacons work: CBP has already saved dozens of people based entirely on beacon alerts." The Border Patrol frequently publishes reports about stranded and injured individuals rescued at beacon locations. During a 12-month period in 2011–12, Border Patrol agents made 1,312 rescues along the Mexico-United States border, nearly half occurring in the Tucson Sector. There are 20 Border Patrol sectors, each headed by a Sector Chief Patrol Agent. All Border Patrol agents spend a minimum of 26 weeks at the Border Patrol Academy in Artesia, New Mexico, which is a component of the Federal Law Enforcement Training Center (FLETC). Border Patrol Agent Trainees are instructed in courses including; Spanish, criminal law, nationality law, and administrative immigration law, police sciences, self-defense and arrest techniques, firearms training with pistol, shotgun and rifle, police vehicle driving, and other Border Patrol / federal law enforcement subjects. Once they arrive back at their duty station, Trainees then must graduate from the Field Training Officer (FTO) program, an on-the-job training program, which varies in length from a minimum of 12 weeks to a maximum of over 16 weeks long, depending on the practical demands of the duty station and local management. They must also successfully complete the Post Academy Training Program, an extension of the Border Patrol Academy where Trainees complete additional classroom-based training over the course of their first nine months back at their duty station. The marksmanship skills of Border Patrol agents ranks among the best in the United States. At the National Police Shooting Championships in 2012, Border Patrol agents placed first, second or third in each of the 29 shooting matches. 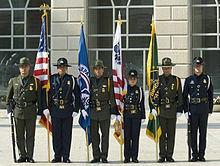 A color guard composed of CBP officers and USBP agents at a Washington, D.C. ceremony in May 2007. Summer Dress uniform – The summer dress uniform consists of a short-sleeve, olive-green dress shirt (which may or may not have blue shoulder straps), brass nameplate, badge, olive-green slacks with a blue stripe running the length of the seam, and black dress shoes or dress boots. A green, straw campaign hat is worn with this uniform. Winter Dress uniform – The winter dress uniform consists of a long-sleeve, olive green dress shirt, navy-blue clip-on tie with a brass tie tack, olive-green ike jacket with blue accents (shoulder straps and cuffs), brass nameplate, badge, olive-green slacks with a blue stripe running the length of the seam, and black dress shoes or dress boots. a green, felt campaign hat with a black, leather hat band is worn with this uniform. Ceremonial Dress uniform – Worn primarily by border patrol honor guard agents, the ceremonial dress uniform is roughly identical to the winter dress uniform, with the exception that a tunic is worn with this uniform, rather than an ike jacket. White, cloth gloves are also worn with this uniform. Rough duty uniform – The rough duty uniform consists of a green, long-sleeve or short-sleeve work shirt, green cargo pants, and black work boots. a green baseball cap is typically worn with this uniform. There are also specialized rough duty uniforms for marine patrol (riverine), northern border cold weather, horse patrol and bike patrol agents. Highland Uniform – Worn by members of the United States Border Patrol Pipes and Drums in the performance of their official duties, this uniform includes a kilt made of the official Border Patrol Tartan, custom made ceremonial coat, glengarry, sporran and spats. The CBP patch is worn on the right sleeves of the uniform. It contains the DHS seal against a black background with a "keystone" shape. A "keystone" is the central, wedge-shaped stone in an arch, which holds all the other stones in place. The Border Patrol uniform is getting its first makeover since the 1950s to appear more like military fatigues and less like a police officer's duty garb. Leather belts with brass buckles are being replaced by nylon belts with quick-release plastic buckles, slacks are being replaced by lightweight cargo pants, and shiny badges and nameplates are being replaced by cloth patches. The Border Patrol's highest honor is the Newton-Azrak Award for Heroism. This Award is bestowed to Border Patrol Agents for extraordinary actions, service; accomplishments reflecting unusual courage or bravery in the line of duty; or an extraordinarily heroic or humane act committed during times of extreme stress or in an emergency. This award is named for Border Patrol Inspectors Theodore Newton and George Azrak, who were murdered by two drug smugglers in San Diego County in 1967. 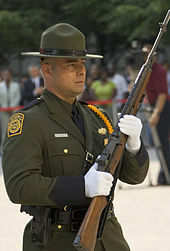 A Border Patrol Honor Guard Agent carrying an M14 rifle. Border Patrol agents are issued the H&K P2000 double action LEM (Law Enforcement Modification) pistol in .40 S&W caliber. It can contain as many as 13 rounds of ammunition (12 in the magazine and one in the chamber). Up until 1994 the Border Patrol issued its Patrol Agents a .357 Magnum revolver as their duty sidearm, a Smith & Wesson or Ruger model large frame, six shot revolver. The Border Patrol preferred this weapon because it did not jam in harsh conditions, like those of the southwestern border, and also because of the strong "stopping" power of the .357 Magnum cartridge. Although up until 1994 Patrol Agents could purchase a weapon from the agency list of approved authorized personal weapons for duty carry. This list included the Glock Models 17 and 19 pistols in 9mm, the SIG Sauer P220 pistol in .45 ACP caliber, the Colt Python .357 Magnum revolver, and the Smith & Wesson Model 19/66 .357 Magnum revolver. The Border Patrol adopted the Beretta Model 96D, a .40 S&W caliber semi-automatic pistol (modified for Double-Action Only) (with 11-round capacity magazines) as its duty issue sidearm in 1995. The .40 S&W caliber jacketed hollow-point cartridge was adopted because of its excellent "stopping" power and its superior ballistic characteristics over the 9mm cartridge. In late 2006 the H&K P2000 pistol was adopted as the Border Patrol's primary duty sidearm. The H&K Model USP Compact pistol, H&K Model P2000SK (sub-compact) and Beretta M96D .40 S&W caliber pistols are authorized as secondary sidearms. On April 9, 2019, CBP announced that the U.S. Border Patrol would transition from the .40 caliber H&K P2000 to an unnamed 9-millimeter Glock pistol by the end of fiscal year 2021. Patrolling a tunnel in Nogales, Arizona. Like many other law enforcement agencies, the 12 gauge Remington Model 870 is the standard pump-action shotgun. The Border Patrol issue Model 870 has been modified by Scattergun Technologies to Border Patrol specifications including: a 14-inch barrel, a five-shot capacity magazine, a composite stock with pistol grip, and night sights with a tactical "ghost-ring" rear sight. The old Border Patrol "anti-bandit" units used to use a 12-gauge, semi-automatic shotgun with a sawed-off barrel. This weapon had the designated name of a "Sidewinder." The USBP anti-bandit units were decommissioned in the late 1980s. Border Patrol agents also commonly carry the .223 caliber Colt M4 Carbine (M4A1) and the H&K UMP .40 caliber submachine gun. The .308 caliber M14 rifle is used for ceremonial purposes and by agents who are qualified with the rifle and BORTAC. As less than lethal options, the Border Patrol uses the FN 303 Launcher. The FN 303 fires plastic pellet balls containing OC (Oleoresin Capsicum) Pepper dust. The plastic pellet balls burst on impact spraying the suspect with OC Pepper dust and also act as an impact projectile. The Border Patrol also issues its agents OC Pepper spray canisters, tasers and a collapsible/telescopic (or telescoping) steel police baton. Patrolling the Rio Grande in an airboat at Laredo, Texas, 2013. A USBP Horse Patrol in southern Texas. Unlike in many other law enforcement agencies in the United States, the Border Patrol operates over 10,000 SUVs and pickup trucks, which are known for their capabilities to move around in any sort of terrain. These vehicles may have individual revolving lights (strobes or LEDs) and/or light bars and sirens and/or have their bumpers removed or have off-road suspension and tires. An extensive modernization drive has ensured that these vehicles are equipped with wireless sets in communication with a central control room. Border Patrol vehicles may also have equipment such as emergency first aid kits. Some sectors make use of sedans like the Ford Crown Victoria Police Interceptor or the Dodge Charger as patrol cars or high speed "interceptors" on highways. The border patrol has approx 2,000 sedans. The Border Patrol also operates all-terrain vehicles, motorcycles, snowmobiles, and small boats in riverine environments. In 2005, all Border Patrol and ICE aircraft operations were combined under CBP's Office of Air and Marine. All CBP vessel operations within the Customs Waters and on the high seas are conducted by Marine Interdiction Agents of the Office of Air and Marine. Color schemes of Border Patrol vehicles are either a long green stripe running the length of the vehicle (older vehicles) or a broad green diagonal stripe (newer vehicles) on the door. Most Border Patrol vehicles are painted predominantly white. During the 1960s to mid-1980s Border Patrol vehicles were painted a light green. The Border Patrol also extensively uses horses for remote area patrols. As of 2005[update], the U.S. Border Patrol has 205 horses. Most are employed along the Mexico–United States border. In Arizona, these animals are fed special processed feed pellets so that their wastes do not spread non-native plants in the national parks and wildlife areas they patrol. Since 1904, the Border Patrol has lost 123 officers in the line of duty, more than any other federal law enforcement agency during that time period. On August 7, 2008, Mexican troops crossed the border into Arizona and held a U.S. Border Patrol Agent at gunpoint. Agents stationed at Ajo, Arizona said that the Mexican soldiers crossed the border into an isolated area southwest of Tucson and pointed rifles at the agent, who has not been identified. The Mexicans withdrew after other U.S. agents arrived on the scene. On March 14, 2000, 16 Mexican soldiers in two humvees chased a Border Patrol agent near Santa Teresa, New Mexico, while another agent came under gunfire. Backup arrived and the soldiers were detained. The Mexican government said the soldiers got lost. The U.S. State Department ordered them sent back to Mexico along with their weapons. Testifying in front of the United States Senate, Border Patrol Chief Mark Morgan said that the Border Patrol is the one of the most assaulted law enforcement agencies; since 2006, over seven thousand agents of the Border Patrol were attacked. On numerous occasions USBP agents have been fired upon from the Mexican side of the international border. Intelligence gathering has discovered bounties being placed on Patrol Agents to be paid by criminal smuggling organizations upon the confirmed murder or kidnapping of a U.S. Border Patrol Agent. In 2008, intelligence learned of a two-million-dollar contract for the murder of a Border Patrol Agent. In 2009 Border Patrol Agent Rosas was murdered in an ambush while on patrol; a bounty may have been paid to the assassins. In February 2005, Border Patrol Agents Ignacio Ramos and Jose Compean were involved in an incident while pursuing a van in Fabens, Texas. The driver, later identified as Aldrete Davila, was shot by Agent Ramos during a scuffle. Davila escaped back into Mexico, and the agents discovered that the van contained a million dollars worth of marijuana (about 750 pounds). None of the agents at the scene orally reported the shooting, including two supervisors: Robert Arnold, first-line Supervisor and Jonathan Richards, a higher ranking Field Operations Supervisor. Ramos and Compean were charged with multiple crimes. Ramos was convicted of causing serious bodily injury, assault with a deadly weapon, discharge of a firearm in relation to a crime of violence, and a civil rights violation. Compeán was found guilty on 11 counts, including discharging a firearm during the commission of a violent crime, which by itself carries a federally mandated 10-year minimum sentence. Without that charge, both agents involved would have received far shorter sentences. Ramos was sentenced to 11 years and a day in prison and Compean to 12 years. Jonathan Richards was promoted to the Patrol Agent in Charge of the Santa Teresa, New Mexico Border Patrol Station soon after the incident. On January 19, 2009, President Bush commuted the sentences of both Ramos and Compean, effectively ending their prison term on March 20, 2009, and they were released on February 17, 2009. The case generated widely differing opinion among various commentators and advocacy groups: civil libertarians asserted the agents used illegal and excessive force, while advocates of tighter border control defended the agents actions. Sergio Adrian Hernandez was a teenager who was shot once and killed on June 7, 2010 by Border Patrol agents under a bridge crossing between El Paso, Texas and Juarez, Mexico. Border Patrol agents claimed that there was a mob that was throwing stones at them. They also claimed that Hernandez was trying to cross the U.S. border and that he had already tried to do so in the past. For his involvement in the incident, Border Patrol agent Jesus Mesa, Jr. invoked qualified official immunity in his defense. On June 10 the Mexican president Felipe Calderón called on the United States to launch a "thorough, impartial" probe into the deaths of two Mexican nationals, including the 14-year-old Hernandez, at the hands of U.S. border police: "I demand the United States government conduct a thorough, impartial ... investigation, concluding with an establishment of the facts and punishment of the culprits." On June 12, 2010 the television network Univision aired cellphone video footage of the incident, after which Mexican legislators called for the extradition of the officer accused of the shooting. On May 30, 2010 Anastasio Hernandez-Rojas died of a heart attack while in the custody of United States Border Patrol (USBP), Immigration and Customs Enforcement (ICE), and U.S. Customs and Border Protection (CBP) and agents and officers at the San Diego–Tijuana border He was beaten and then shocked by Tasers on at the San Diego–Tijuana border within view of many bystanders with cameras on the busy pedestrian bridge at the San Ysidro Port of Entry. Although the United States Department of Justice (DOJ) investigation concluded on November 6, 2015 that Hernández Rojas died of a heart attack, an offer of a million-dollar settlement was made to his family. None of the agents or officers involved were fired or disciplined for excessive use of force. In February 2017, his common-law wife and five children accepted the settlement. Hernández-Rojas's death was profiled in a 2012 PBS report called Crossing the Line, in Nonny de la Peña's, 2013 five-minute-long virtual reality called Use of Force and in a 2014 American Civil Liberties Union report. As the Washington Office on Latin America's Border Fact Check site points out, a similar incident occurred in October 2012 when 16-year-old Jose Antonio Elena Rodriguez was killed in downtown Nogales, Mexico when a Border Patrol Agent, Lonnie Swartz, opened fire at a group of people allegedly throwing rocks at him; Rodriguez was shot seven times in the back. WOLA and other human rights organizations assert that "...[L]aw enforcement experience offers a series of non-lethal responses to rock throwing incidents along the U.S.-Mexico border," such as pepper ball launchers. In September 2015, Swartz was indicted on the charge of second-degree murder. On November 25, 2013, the San Diego Tribune reported that 100 migrants who tried to cross the border illegally near the San Ysidro port were pepper-sprayed and tear-gassed after throwing bottles and rocks at border patrol agents. A similar incident was reported in November 2018. Between 2010 and 2011 alleged excessive use of force by Border Patrol and Field Operations agents led to the death of six Mexican citizens. A PBS report, Crossing the Line, released in July 2012, profiled the case of Hernández-Rojas who died after being beaten and while in custody of the USBP, ICE, and CBP in May 2010. In 2012, in a letter to President Obama posted on the website of the Washington Office on Latin America, 118 civil society organizations criticized the Border Patrol for failing to thoroughly investigate the incident and stated that the Border Patrol "is operating with very little transparency and virtual impunity, especially in the southern border region where Border Patrol and other CBP agents regularly violate the human and civil rights of those who call the border region home." From 2008–2011, the Arizona organization No More Deaths interviewed nearly 13,000 migrants who had been in Border Patrol custody, in the Arizona border towns of Naco, Nogales, and Agua Prieta. Their report, A Culture of Cruelty, documents alleged abuses including denial of or insufficient water and food; failure to provide medical treatment; verbal, physical and psychological abuse; separation of family members and dangerous repatriation practices. In February 2012, Border Patrol Chief Michael Fisher stated in congressional testimony that the Border Patrol takes allegations of abuse seriously. However, No More Deaths testified before the Inter-American Commission of Human Rights in March 2012 and stated that in spite of raising their concerns for several years, "the agency has taken the position that such abuses simply do not occur." There are allegations of abuse by the United States Border Patrol such as the ones reported by Jesus A. Trevino, that concludes in an article published in the Houston Journal of International Law (2006) with a request to create an independent review commission to oversee the actions of the Border Patrol, and that creating such review board will make the American public aware of the "serious problem of abuse that exists at the border by making this review process public" and that "illegal immigrants deserve the same constitutionally-mandated humane treatment of citizens and legal residents". In 1998, Amnesty International investigated allegations of ill-treatment and brutality by officers of the Immigration and Naturalization Service, and particularly the Border Patrol. Their report said they found indications of human rights violations during 1996, 1997 and early 1998. An article in Social Justice by Michael Huspek, Leticia Jimenez, Roberto Martinez (1998) cites that in December 1997, John Case, head of the INS Office of Internal Audit, announced at a press conference that public complaints to the INS had risen 29% from 1996, with the "vast majority" of complaints emanating from the southwest border region, but that of the 2,300 cases, the 243 cases of serious allegations of abuse were down in 1997. These serious cases are considered to be distinct from less serious complaints, such as "verbal abuse, discrimination, extended detention without cause." U.S. Customs and Border Protection gave Accenture Federal Services a $297 million contract in 2017 to hire 7,500 people over five years. An audit by the Department of Homeland Security found that, as of Oct. 1, 2018, Accenture had already been paid $13.6 million but had only hired two people. Pablo Sergio Barry, an agent charged with one count of harboring an illegal alien (8 U.S.C. § 1324), three counts of false statements, and two counts of making a false document. He pleaded guilty. Christopher E. Bernis, an agent indicted on a charge of harboring an illegal alien for nine months while employed as a U.S. Border Patrol Agent. Jose De Jesus Ruiz, an agent whose girlfriend was an illegal alien. He was put on administrative leave pending an investigation. Oscar Antonio Ortiz, an illegal alien who used a fake birth certificate to get into the Border Patrol. He admitted to smuggling more than 100 illegal aliens into the U.S., some of them in his government truck. He was charged with conspiring with another agent to smuggle aliens. An unidentified patrol agent who was recorded on a wiretap stating that he helped to smuggle 30 to 50 aliens at a time. National Border Patrol Council (NBPC) is the labor union which represents over 17,000 Border Patrol agents and support staff. The NBPC was founded on November 1, 1965, and its parent organization is the American Federation of Government Employees, AFL-CIO. The NBPC's executive committee is staffed by current and retired Border Patrol agents and, along with its constituent locals, employs a staff of a dozen attorneys and field representatives. The NBPC is associated with the Peace Officer Research Association of California Legal Defense Fund|California's Legal Defense Fund. The Border Patrol Foundation was founded in 2009 to assist the survivors of agents killed in the line of duty. The foundation provides financial support to immediate family members, peer family support, and a scholarship to eligible children. The foundation recognizes community leaders who have supported the families of fallen agents, and supports programs to improve awareness of the risks faced by agents. Border Patrol, by Alvin Edward Moore. The Border Patrol, by Deborah Wells Salter. EWI: Entry Without Inspection, by Fortuna Testarona Valiente. Tracks in the Sand: A Tale of the Border Patrol, by Kent E Lundgren. On The Line: Inside the U.S. Border Patrol, by Alex Pacheco and Erich Krauss. Patrolling Chaos: The U.S. Border Patrol in Deep South Texas, by Robert Lee Maril. The U.S. Border Patrol: Guarding the Nation, by Connie Collwell Miller. My Border Patrol Diary: Laredo, Texas, by Dale Squint. Holding the Line: War Stories of the U.S. Border Patrol, by Gerald Schumacher. The Border Patrol Ate My Dust, by Alicia Alarcon, Ethriam Cash Brammer, and Ethriam Cash Brammer de Gonzales. The Border: Exploring the U.S.-Mexican Divide, by David J. Danelo. Beat The Border: An Insider's Guide to How the U.S. Border Works and How to Beat It, by Ned Beaumont. West of the Moon: A Border Patrol Agent's Tale, by D.B. Prehoda. The Journey: U.S. Border Patrol & the Solution to the Illegal Alien Problem, by Donald R. Coppock. Border Patrol: With the U.S. Immigration Service on the Mexican boundary, 1910–54, by Clifford Alan Perkins. Border Patrol: How U.S. Agents Protect Our Borders from Illegal Entry, by Carroll B. Colby. In Mortal Danger: The Battle for America's Border and Security, by Tom Tancredo. Border Songs, by Jim Lynch. Crossing the Wire, by Will Hobbs. Border Patrolman, a 1936 film in which Border Patrolman Bob Wallace, played by George O'Brien, resigns in protest after being humiliated by the spoiled granddaughter of a millionaire. Border Patrol, a 1943 film starring William C. Boyd, Andy Clyde, George Reeves, and Robert Mitchum. Borderline, a 1950 film noir starring Fred MacMurray about drug smuggling across the Mexico-U.S. border. Border Patrol, a 1959 television series starring Richard Webb as the fictitious deputy chief of the U.S. Border Patrol. Borderline, a 1980 movie starring Charles Bronson about a Border Patrol Agent in charge of a station located in the hills southeast of San Diego, near the Mexico-U.S. border. Bronson's character and the agents under his command pursue and apprehend a violent human trafficker/smuggler played by Ed Harris who murdered a veteran patrol agent, portrayed by Wilford Brimley, who had intercepted the smuggler one evening bringing in a shipment of illegal aliens across the border. Their investigation leads to the breaking up of the vicious smuggling operation run by Harris's character. Border Cop, a 1980 film starring Telly Savalas. The Border, a 1982 film starring Jack Nicholson as a patrol agent working on the Mexico-U.S. border. El Norte, a 1983 film about the plight of Central American Indian peasants traveling to the Mexico-U.S. border. The 1983 movie Lone Wolf McQuade deals with smuggling and criminals in various parts of Texas including the Mexico-U.S. border. Flashpoint, a 1984 film starring Kris Kristofferson, Treat Williams, Rip Torn, and Kurtwood Smith. Last Man Standing, a 1996 film starring Bruce Willis as a professional gunman and Ken Jenkins as Texas Ranger Captain Tom Pickett who is investigating the murder of an unnamed patrol inspector (played by Larry Holt) in the town where Willis's character is working. Men in Black, a 1997 science fiction comedy action film starring Tommy Lee Jones, Will Smith and Vincent D'Onofrio. The Border Patrol is portrayed as Immigration Inspectors in an unflattering portrayal. The Gatekeeper, a 2002 film by John Carlos Frey about the struggles of migrants at the Mexico-U.S. border. The Three Burials of Melquiades Estrada, a 2005 film by Tommy Lee Jones about the accidental killing of an illegal Mexican alien by a Border Patrol Agent. The Shepherd: Border Patrol, a 2007 film starring Jean-Claude Van Damme. Linewatch, a 2008 film starring Cuba Gooding, Jr., as a Border Patrol agent defending his family from a group of Los Angeles gang members involved in narcotics importation. Hunt to Kill, A 2010 film starring Stone Cold Steve Austin and Eric Roberts as U.S. Border Patrol Agents. Border Patrol: American's Gatekeepers, by A&E Network with former U.S. Attorney General Janet Reno. Investigative Reports: Border Patrol: America's Gatekeepers, by A+E Networks Investigates. History the Enforcers: Border Patrol, by the History Channel. Border Wars, a "reality" television program produced by the National Geographic Channel. Run For Your Life, a Canadian Broadcasting Corporation documentary about the dangers faced by young Hondurans aboard a freight train headed to the Mexico-U.S. border, where they will seek illegal entry. Under Siege: America's Northern Border by Discovery Channel. A 2013 documentary about the efforts and difficulties of agents to prevent illegal cross-border activities in the Detroit, Michigan area. ^ a b c d "Border Patrol Names Carla Provost Acting Chief". U.S. News & World Report. April 26, 2017. Retrieved June 28, 2017. ^ "Border Patrol Overview: Mission". U.S. Customs and Border Protection. January 5, 2011. Archived from the original on October 17, 2009. ^ "Along U.S. Borders". Department of Homeland Security. September 18, 2015. Archived from the original on May 7, 2016. ^ a b "Number of Border Patrol agents quadrupled since 2005?". @politifact. ^ "On a Typical Day in Fiscal Year 2011" (PDF). U.S. Customs and Border Protection. Archived from the original (PDF) on February 16, 2013. Retrieved September 21, 2016. ^ "United States Enacted Border Patrol Program Budget by Fiscal Year" (PDF). U.S. Customs and Border Protection. U.S. Department of Homeland Security. Retrieved June 24, 2018. ^ a b "Border Patrol History". U.S. Customs and Border Protection. April 3, 2014. Retrieved February 3, 2019. ^ "Detroit Station | U.S. Customs and Border Protection". www.cbp.gov. Archived from the original on December 15, 2016. Retrieved September 21, 2016. ^ "El Paso Sector Texas | U.S. Customs and Border Protection". www.cbp.gov. Archived from the original on December 15, 2016. Retrieved September 21, 2016. ^ "Detroit Welcome". CBP. Archived from the original on March 4, 2013. ^ "A History of the United States Border Patrol". National Border Patrol Museum. Archived from the original on September 8, 2013. Retrieved April 10, 2013. ^ a b "Who we are and what we do". CPB.gov. U.S. Customs and Border Protection. September 3, 2008. Archived from the original on May 10, 2009. Retrieved June 1, 2009. ^ Mejia, Brittny (April 23, 2018). "Many Latinos answer call of the Border Patrol in the age of Trump". Los Angeles Times. Retrieved June 24, 2018. ^ Starr, Tina (April 28, 2010). "Local man's film highlights plight of migrant farm workers". Barton, Vermont. Retrieved August 9, 2018. ^ Broder, John M. (July 4, 2005). "With Congress's Blessing, a Border Fence May Finally Push Through to the Sea". The New York Times. ISSN 0362-4331. Archived from the original on October 28, 2015. Retrieved December 8, 2015. ^ Engber, Daniel (September 25, 2006). "What's a Double-Layer Fence". Slate. ISSN 1091-2339. Archived from the original on December 10, 2015. Retrieved December 8, 2015. ^ "Border Control: Revised Strategy Is Showing Some Positive Results". www.gao.gov. Archived from the original on December 11, 2015. Retrieved December 8, 2015. ^ Border Patrol Agrees To Reinstate Whistleblowers Archived July 22, 2013, at the Wayback Machine. CNS News. Retrieved on July 23, 2013. ^ "Border Patrol Sectors | U.S. Customs and Border Protection". www.cbp.gov. Archived from the original on August 30, 2016. Retrieved September 21, 2016. ^ "National Border Patrol Strategy" (PDF). Archived from the original (PDF) on November 12, 2005. Retrieved November 28, 2005. ^ a b c d e "Border Patrol overview". CPB.gov. U.S. Customs and Border Protection. August 22, 2008. Archived from the original on October 17, 2009. Retrieved June 1, 2009. ^ Woodard, Colin (January 9, 2011). "Far From Border, U.S. Detains Foreign Students". The Chronicle of Higher Education. Archived from the original on July 21, 2013. ^ Kelly, Erin (June 3, 2010). "Governor:Ariz. besieged". Melbourne, Florida: Florida Today. pp. 5A. Retrieved August 9, 2018. ^ Carroll, Rory (December 12, 2016). "Life as a Mexican American on the Border Patrol: 'The system is not broken'". Guardian. United Kingdom. Archived from the original on December 30, 2016. Retrieved December 31, 2016. ^ Coyle, Marcia (March 3, 2008). "Waivers for border fence challenged: Environmental groups take their complaints to Supreme Court". The Recorder. ^ Archibold, Randal C. (April 2, 2008). "Government issues waiver for fencing along border". New York Times. Archived from the original on September 27, 2011. Retrieved April 2, 2008. ^ "Conservation groups call for an immediate halt to construction of border fence in San Pedro National Conservation Area". US Newswire. October 5, 2007. ^ Gordon, David George (May 2000). "A 'grande' dispute". National Geographic World. p. 4. ^ Cohn, Jeffrey P. (2007). "The environmental impacts of a border fence". BioScience. 57 (1): 96. doi:10.1641/B570116. Retrieved June 1, 2009. ^ "Expansive border fence stirs fights over land". Tell Me More. March 3, 2008. NPR. Archived from the original on May 16, 2008. ^ Border Patrol Overview Archived October 17, 2009, at the Wayback Machine. CBP.gov. Retrieved on July 23, 2013. ^ Fan, Mary D. "Prevention-Through-Deterrence and Death Mitigation: Fantasy and Fetishes in Border Law's Symbolic Order". All Academic. Archived from the original on March 4, 2016. Retrieved September 21, 2016. ^ "U.S. Border Patrol Southwest Border Fence Maps" (PDF). U.S. Customs and Border Protection. February 13, 2013. Archived (PDF) from the original on September 23, 2013. ^ Kolb, Joseph J. (July 1, 2013). "Fort Hancock, Texas: Where a fence and hope for illegals ends". Fox News Channel. Archived from the original on September 22, 2013. ^ "A Continued Humanitarian Crisis at the Border: Undocumented Border Crosser Deaths Recorded by the Pima County Office of the Medical Examiner, 1990–2012" (PDF). University of Arizona. 2013. Archived from the original (PDF) on September 20, 2013. ^ "Border-Crossing Deaths Have Doubled Since 1995; Border Patrol's Efforts to Prevent Deaths Have Not Been Fully Evaluated" (PDF). U.S. Government Accountability Office. August 2006. Archived (PDF) from the original on September 30, 2014. 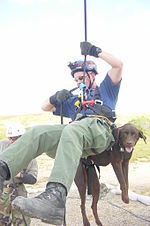 ^ "Border Patrol Search, Trauma, and Rescue (BORSTAR)" (PDF). U.S. Customs and Border Protection. May 2009. Archived from the original (PDF) on September 26, 2013. ^ a b Polliard, Brittany. "Rescue Beacons ("Panic Poles")". National Border, National Park: A History of Organ Pipe Cactus National Monument. Archived from the original on September 1, 2013. Retrieved June 24, 2018. ^ Stine, Mark. "Border Patrol Rescue Beacons". KOLD News Tucson. Archived from the original on September 23, 2013. Retrieved June 24, 2018. ^ "United States Border Patrol Sector Profile – Fiscal Year 2012" (PDF). U.S. Customs and Border Protection. February 4, 2013. Archived from the original (PDF) on March 3, 2013. ^ "Past National Police Shooting Championships Results". National Rifle Association of America. Archived from the original on November 26, 2016. Retrieved September 21, 2016. ^ Spagat, Elliot (August 16, 2007). "Border Patrol uniform gets first makeover since the 1950s". North County Times. Archived from the original on June 26, 2009. Retrieved June 1, 2009. ^ "Border Patrol Inspector Theodore L. Newton Jr". The Officer Down Memorial Page. Archived from the original on September 27, 2007. Retrieved June 1, 2009. ^ "Border Patrol Inspector George F. Azrak". The Officer Down Memorial Page. Archived from the original on September 30, 2007. Retrieved June 1, 2009. ^ Rostien, Arthur H. (June 9, 2005). "Border Patrol horses get special feed that helps protect desert ecosystem". Environmental News Network. Archived from the original on September 3, 2009. Retrieved June 1, 2009. ^ Meyers, Jim (August 6, 2008). "Mexican troops cross border, hold border agent". Newsmax.com. Archived from the original on August 22, 2008. Retrieved June 1, 2009. ^ Gehrke, Joel (September 13, 2016). "Border Patrol chief: Agents 'most assaulted' law officers in the U.S." Washington Examiner. Archived from the original on May 10, 2017. Retrieved December 31, 2016. ^ "Rock Throwing Attacks on Border Patrol Agents on the Rise". KRGV. Rio Grande Valley, Texas. December 1, 2016. Archived from the original on January 1, 2017. Retrieved December 31, 2016. ^ Robert W. Rosas, Jr. Archived March 7, 2010, at the Wayback Machine. CBP.gov. Retrieved on July 23, 2013. ^ "Uproar over U.S. Border Patrol shooting". UPI. August 28, 2006. Archived from the original on February 10, 2014. Retrieved March 8, 2012. ^ "Ramos and Campean – court appeal". Archived from the original on July 24, 2012. Retrieved June 1, 2009. ^ Seper, Jerry (August 23, 2006). "Lawmakers seek review of border agent case". The Washington Times. Retrieved December 14, 2006. ^ Gilot, Louis (October 20, 2006). "Sentence handed to border agents; free until Jan. 17". El Paso Times. Archived from the original on November 2, 2006. Retrieved December 14, 2006. ^ "DA: Teen Who Allegedly Smuggled Aliens Should Be Tried as Adult". ABC News. April 17, 2012. Archived from the original on April 12, 2016. Retrieved September 21, 2016. ^ Riechmann, Deb. "Bush commutes prison sentences of 2 former U.S. border agents" Archived January 23, 2009, at the Wayback Machine, Associated Press, January 19, 2009. ^ "Ex-Border Patrol Agents Released Early from Prison". CNN. February 17, 2009. Archived from the original on October 16, 2013. ^ a b "U.S. border agent kills Mexican teen". Toronto Sun. June 9, 2010. Retrieved July 1, 2010. ^ Doyle, Charles (May 22, 2018). Is There Liability for Cross-Border Shooting? (PDF). Washington, DC: Congressional Research Service. Retrieved June 5, 2018. ^ "Mexico urges U.S. probe of border deaths". Sydney Morning Herald. June 11, 2010. Archived from the original on December 7, 2010. Retrieved July 1, 2010. ^ "Video Fuels Anger Over Mexico Border Shooting". Sky News. June 12, 2010. Archived from the original on June 15, 2010. Retrieved July 1, 2010. ^ "U.S. Border Patrol shooting (new video) threatens Mexico drug war cooperation". Christian Science Monitor. Archived from the original on June 14, 2010. Retrieved July 1, 2010. ^ a b c Meyer, Maureen. "Are migrants routinely abused by Customs and Border Protection agents?". Border Fact Check. Washington Office on Latin America. Archived from the original on January 20, 2013. Retrieved August 23, 2012. ^ Chris Rickerd (May 28, 2014). "Justice for Anastasio". American Civil Liberties Union (ACLU). ACLU Washington Legislative Office. Archived from the original on November 25, 2015. Retrieved March 29, 2017. ^ Meyer, Maureen. "Is firing bullets at rock throwers a justified use of force by the Border Patrol?". Border Fact Check. Washington Office on Latin America. Retrieved October 23, 2012. ^ "U.S. Border Patrol agent indicted for murder over 2012 shooting". Reuters. September 25, 2015. Archived from the original on March 5, 2016. ^ Aguilera, Susan Shroder, Elizabeth. "Border Patrol: crowd confronts agents". sandiegouniontribune.com. ^ "Trump defends use of tear gas against migrants, including children, as Beto O'Rourke and others condemn tactic". Dallas News. November 26, 2018. ^ "U.S. Organizations Urge President Obama to Address Border Patrol Abuses". Washington Office on Latin America. Archived from the original on November 8, 2012. Retrieved August 23, 2012. ^ Fisher, Michael. "Testimony of Chief Michael Fisher" (PDF). Transcript of House Appropriations Subcommittee on Homeland Security Hearing on the Proposed Fiscal 2013 Appropriations for the U.S. Customs and Border Protection. House Appropriations Subcommittee on Homeland Security. Archived from the original (PDF) on April 12, 2013. Retrieved August 23, 2012. ^ Jesus A. Trevino (1998). "Border violence against illegal immigrants and the need to change the border patrol's current complaint review process" (PDF). Houston Journal of International Law. 21 (1): 85–114. ISSN 0194-1879. Archived from the original (PDF) on July 26, 2011. Retrieved June 1, 2009. ^ "United States of America: Human rights concerns in the border region with Mexico". Amnesty International. May 19, 1998. Archived from the original on October 21, 2007. Retrieved June 1, 2009. ^ Huspek, Michael; Roberto Martinez; Leticia Jimenez (1998). "Violations of human and civil rights on the U.S.-Mexico border, 1995 to 1997: a report" (Reprint). Social Justice. 25 (2). ISSN 1043-1578. Retrieved June 1, 2009. The data compiled in this report suggest that law enforcement in the southwest region of the United States may be verging on lawlessness. This statement receives fuller support from announcements emanating from the INS. In December 1997, John Chase, head of the INS Office of Internal Audit, announced at a press conference that public complaints to the INS had risen 29% from 1996, with the "vast majority" of complaints emanating from the southwest border region. Over 2,300 complaints were filed in 1997 as opposed to the 1,813 complaints filed in 1996. Another 400 reports of "minor misconduct" were placed in a new category. Chase was quick to emphasize, however, that the 243 "serious" allegations of abuse and use of excessive force that could warrant criminal prosecution were down in 1997, as compared with the 328 in 1996. These "serious" cases are considered to be distinct from less serious complaints, such as "verbal abuse, discrimination, extended detention without cause. ^ Papenfuss, Mary (December 11, 2018). "Trump Administration Paid Firm Nearly $14 Million To Recruit Just 2 Border Agents". Huffington Post. Retrieved December 11, 2018. ^ 8 USC § 1324 – Bringing in and harboring certain aliens | Title 8 – Aliens and Nationality | U.S. Code | LII / Legal Information InstituteArchived April 5, 2017, at the Wayback Machine. Law.cornell.edu. Retrieved on July 23, 2013. ^ "Border agent accused of hiding an illegal entrant". Arizona Daily Star. June 23, 2005. Archived from the original on December 21, 2007. Retrieved June 1, 2009. ^ "Border agent pleads guilty to harboring illegal entrant". Arizona Daily Star. September 22, 2005. Archived from the original on December 21, 2007. Retrieved June 1, 2009. ^ a b "U.S. border agent indicted". Arizona Daily Star. March 11, 2005. Archived from the original on December 21, 2007. Retrieved June 1, 2009. ^ Spagat, Elliot (July 28, 2006). "Border agent gets 5 years for smuggling". The Washington Post. Archived from the original on March 31, 2012. Retrieved June 1, 2009. ^ "About NBPC". National Border Patrol Council. August 14, 2008. Retrieved June 1, 2009. ^ "Border Patrol Foundation". Border Patrol Foundation. 2013. Archived from the original on May 31, 2013. ^ "Union-Backed Ronald Vitiello Named to Lead Border Patrol". NBCUniversal. January 31, 2017. Archived from the original on February 1, 2017. ^ Litton, Andra (January 27, 2017). "Border Patrol Chief Mark Morgan Resigns". Elpasoproud.com. Archived from the original on January 27, 2017. ^ "Carla Provost officially named first female chief of Border Patrol". Retrieved August 9, 2018. Kelly Lytle Hernandez. Migra! A History of the U.S. Border Patrol (University of California Press; 2010) 274 pages; draws on previously lost and untapped records in a history of the force since its beginnings in 1924. 1924 establishments in Washington, D.C. This page was last edited on 20 April 2019, at 22:44 (UTC).